With the inauguration on Wednesday, May 6th, 2015 by the President of Honduras, the largest solar power project in Latin America and the most efficient worldwide came online promising rapid relief to a country beset by power outages. 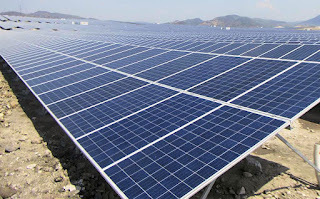 The project is referred to as the Nacaome and Valle Solar Power Plant since the project consist of two adjacent sites, “Agua Fría” and “La Llave”, in the Nacaome region of the State of Valle located in the southern part of Honduras near the Pacific coast about 130 kilometers south of the capital of Tegucigalpa. The two neighboring sites are part of the same utility-scale project with a total rated output of 145.9MWp making it not only the largest solar power plant in Honduras and but also the largest in the whole of Latin America. The solar power plant will produce an average of approximately 257 GWh per annum and represents 7.1% of all energy generated in the country. 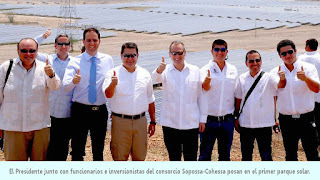 The project sites were developed by a group of private investors from Solar Power Sociedad Anónima (SOPOSA) for the Nacaome site and Compañía de Energía Solar Sociedad Anónima (COHESSA) for the Valle site, firms founded in 2012 in San Pedro Sula, Honduras and headed by Napoleón Larach. 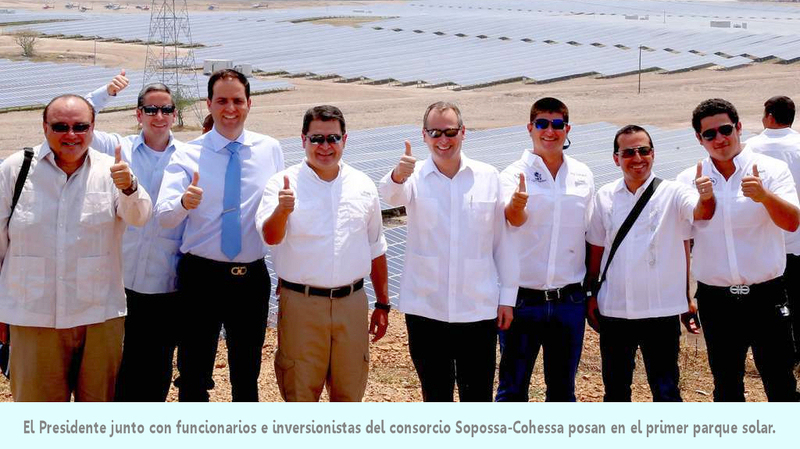 SOPOSA and COHESSA, wholly-owned subsidiaries of Inversiones y Representaciones Electromecánicas, S.A. (IRESA), successfully secured a 20-year Power Purchase Agreement (“PPA”) with the state-owned utility Empresa Nacional de Energía Eléctrica (ENEE). IRESA is the investment vehicle used by the Larach Group for developing energy projects in Honduras. 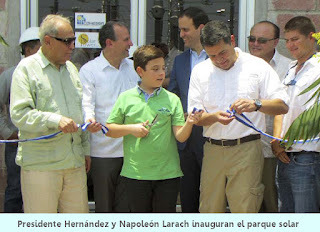 The Larach Group has been active in Honduras since the early 1900’s through local retailer and other business segments, and has been gradually diversifying into renewable energy. Together with the 58MW La Vegona hydropower project, the Larach Group now has roughly 205 MW of renewable energy projects in operation in Honduras. Their renewable energy portfolio has recently expanded to include a combined total of 215 MW of hydro and geothermal projects currently under development in the north and west of the country. 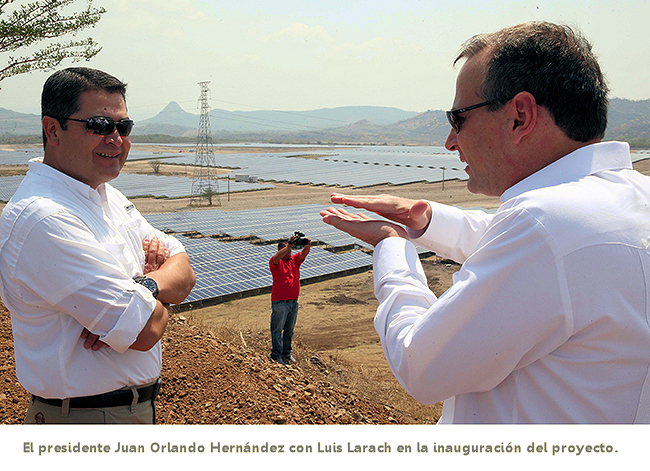 The Nacome and Valle Solar Power Plant was built at a cost of US$232MM which includes construction of the solar farm, the interconnection lines, and a substation. Among the institutions providing financing were the World Bank’s International Finance Group and Finnfund. After completing an Environmental Impact Study, the expansive power plant was built in just 10 months on 974 acres of land. The combined facility has over 16 kilometers of perimeter fencing and over 22 kilometers of internal transit roads. During the construction phase roughly 2,500 direct and indirect jobs were created. The facility now has about 150 permanent employees for operation and maintenance. Over 1 million square meters of land area are covered with 480,500 CS6X-P 72-polycrystalline cell solar modules made by Canadian Solar. Rated at Nominal Max. 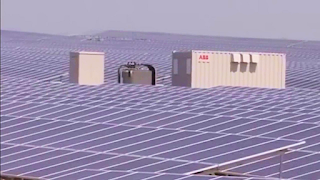 Power (Pmax) 305 W groups of solar modules are strung to ABB monitoring junction boxes. These junction boxes then feed into ABB’s 2 MW PVS800-IS inverter stations, each containing two 1 MW PVS800 central inverters. There are a total of 104 inverters (52 PVS800-IS) each with a Maximum input power (PPV, max) of 2 x 1200 kW, a Nominal AC output power (PAC, N) of 2 x 1000 kW, and a Power Ratioeff of 1.344, so that a total of 0.94MW MW of PPV is fed into each side of the inverter from the junction boxes. To improve efficiency and reduce transmission losses, each inverter station is also paired with ABB’s 34.5 kV medium voltage (MV) stations and ring main units (RMU) to ensure the electric balance of the plant. A 230kV high voltage substation was built on site to receive the power generated from each of the inverter stations. 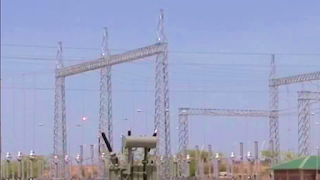 Interconnection of the project to the grid is achieved through the interception of an existing 230kV transmission line and the high voltage substation which was built at the interception point. The plant’s monitoring and control is achieved through an ABB automation module containing the Symphony® Plus SCADA system that monitors and controls plant production and coordinates output with the requirements and grid codes of the transmission system operator. It also collects vital plant data to ensure that the plant’s performance targets are being met. 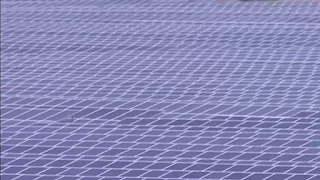 Together with the latest technology to maximize energy generation and a distribution system designed to reduce energy transmissions losses, the project is considered to be the most efficient solar power plant worldwide. The solar irradiation at the site is 6 kVh per day per square meter. This is twice the 3 kVh per day per square meter of Germany where there are over 38 GW of solar energy generation. The Nacaome-Valle solar power plant will generate the entire 145.9MW capacity between 11:00 a.m. and 2:00 p.m. the peak solar irradiation hours. This solar power plant is part of a wider effort by ENEE and the Government of Honduras to diversify the country’s electricity supply and improve the reliability of the power grid. The Government of Honduras has set an aggressive renewable energy agenda to support the diversification of Honduras' energy matrix moving away from a fossil fuel based energy generation model. This will contribute to the reduction of expensive imports of diesel and bunker, which consequently could help strengthen public finances. Finally the renewable energy projects promote a climate change agenda, as these projects are expected to displace thermal power generation hence reducing carbon emissions. With this solar power plant coming online, the country’s energy matrix is now composed 52.5% from renewable energy and 47.5% from thermal energy. This compares favorably to the structure as recently as 2010 which was 70% thermal energy and 30% renewable. 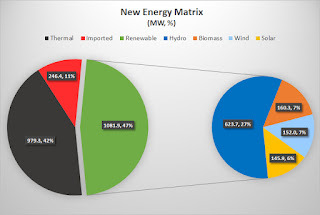 The nation’s energy matrix now consists of 42% primarily private thermal (979.3 MW), 27% primarily state owned hydroelectric (623.7 MW), 7% private biomass (160.3 MW) and 7% from 2 private wind farms (152 MW), and 6% from this new private solar farm (145.9MW). The installed generation capacity is now 2.1GW which can supply 89% of the country’s energy demand. The country still must import 11% (264.4MW) of energy but with new solar, hydro, and geothermal projects coming online Honduras is expected to not only be self-sufficient, but phase out a significant portion of the thermal energy generation by the end of 2015. With a total rated output of 145.9MWp the Nacaome-Valle solar plant can supply 6.3% of the country’s total 2.3GW energy demand, and supply the energy needs of 71,500 homes. With thermal energy projects being phased out as renewable energy projects come on line, this solar plant will reduce emissions by 167,300 tons per year and annually save about 167,300 barrels in fossil fuel purchases which at current market rates represents over US$8MM in savings per year. For the 257 GWh per annum generated by the Nacaome-Valle solar plant the ENEE will pay COHESSA-SOPOSA about $US0.18 per kWh. The PPA purchase price is determined by the ENEE’s marginal cost per kWh plus a 10% incentive, and a US$0.03 bonus per kWh for solar power plants that come online before July 31, 2015. 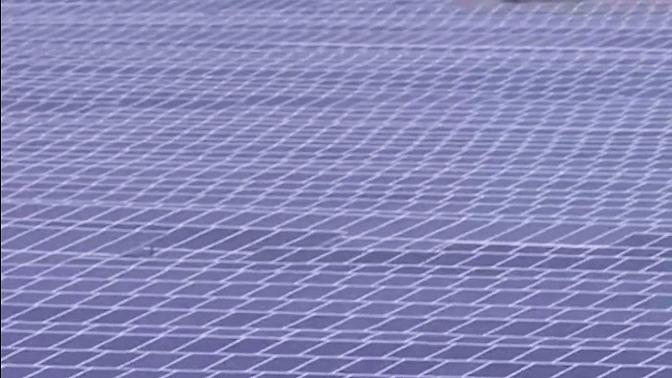 Watch the video below showcasing the solar power plant.